Mind Over Mushroom Challenge, Day 9: Winds of Change? I ate it all. And I did it one bite at a time. One slow, thoughtful bite at a time. You know what? It wasn’t that bad. I mean, I’m not a lover of breakfast and today’s meal was a mushroom-infused omelet so I had some things to overcome. It’s not that I hate breakfast – I just like other meals better. Sometimes I fast-track lunch and put it bright and early in the morning… I can have a pizza pie for breakfast and be quite content with that. So. Things weren’t that bad. Whereas before I couldn’t even fathom the idea of a mushroom coming anywhere near my eating facilities, now I’m buckling down mentally and forcing myself to eat them. I still say force because it is not easy… yet. As much as it is about the mushrooms, it’s also not. I have realized how close-minded towards mushrooms I have been in the past and how that has become an ingrained part of my life. The things that seemingly comprise who you are, are everything from your humour and personality to your fears and dislikes and your universal truths. The thing about your universal truths is that it’s hard to get out of the mentalities that created them. It’s hard to change who you are. But it can be done. We will see if I can pull this change off. …Meanwhile, my Mom is probably across the country-side muttering to herself damn kids. Whine and squeal and pout and puke when you tell them a mushroom is a piece of ham then turn around 15 years later and eat them every damn day. 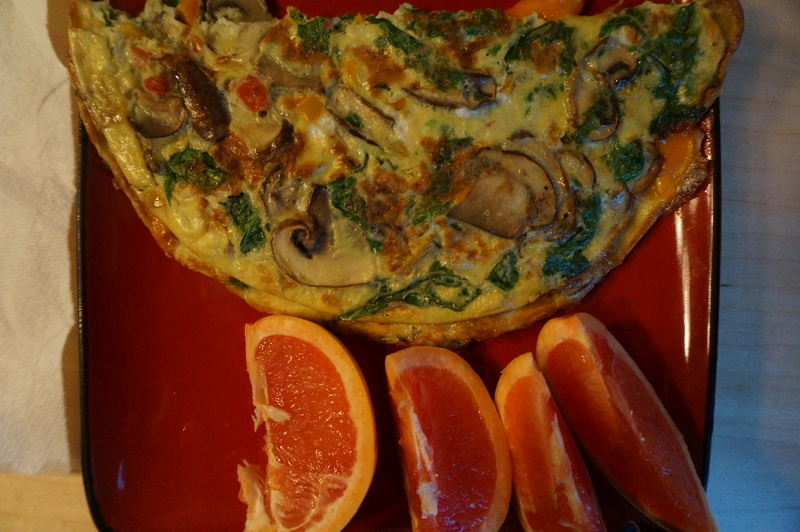 Omelet: cremini mushrooms, eggs, spinach, flour, orange, red and yellow peppers, seasoning salt, garlic, cheddar, green onion.